It’s somewhat ironic that Nestlé is introducing WONKA Exceptionals, as the original Willy Wonka chocolate bar was a failure. 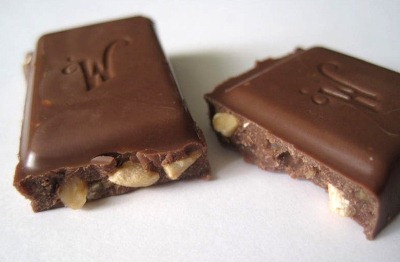 The other day I saw a television commercial advertising WONKA Exceptionals, a premium line of chocolate bars that includes: the Scrumdiddlyumptilous Chocolate Bar [pictured]; the Chocolate Waterfall Bar; and the Domed Dark Chocolate Bar. It’s somewhat ironic that Nestlé is introducing these “delicious and decadent—yet imaginative and whimsical” confections on the strength of the Wonka name, as the original Willy Wonka and the Chocolate Factory (1971) was produced as a vehicle for launching a chocolate bar. Except the chocolate bar Quaker Oats had in mind never materialized, and without a cohesive promotional strategy the film stumbled at the box office. “They didn’t quite get the ingredients right and abandoned the idea of selling a Wonka bar,” said Willy Wonka and the Chocolate Factory director Mel Stuart in an interview with Failure in 2003. So when the movie was released on July 7, 1971, ticket sales were underwhelming. Wonka ended the year as the #53 film, grossing approximately $4 million. It wasn’t until much later, after Quaker sold the movie to Warner Bros. in 1977, that the film became a classic. And correct me if I’m wrong, but Wonka candies weren’t produced until 1983. So despite the fact that “the world has long identified WONKA with chocolate,” said Nestlé spokesperson Tricia Bowles back in February, it took nearly four decades before a candy company produced chocolate befitting the Wonka name. Nets can't finish worst—The New Jersey Nets eliminated any chance of setting an NBA record for fewest wins in a season by beating the Detroit Pistons in East Rutherford, New Jersey. Marriage proposal kills baby sea turtles—Sad story. Man’s candlelit marriage proposal kills 60 endangered sea turtle hatchlings. The Bush Tax Cuts—In terms of promoting economic growth and creating jobs the Bush tax cuts have been a miserable failure.